When Are We Going to Grow Up? The Juvenilization of American Christianity. How big is the Universe? BIG! (check out this infographic). One indispensable rule for using social media. Cheesiest man cave. If I weren’t a Christian, I might be this man. 16 Ways to find a wife according to the Bible. How cereal transformed American Culture. Dirty Car slide show. Car wash lately? Jarrod Dyson, Rollie Fingers, and How We View the World. Get rich slow. Biblical bean counting. What if I have a conflict with my spouse Sunday morning before church? I wish I could answer this from a hypothetical perspective. I cannot. In fact, I have fresh experience from which to write this post. There are significant implications for the pastor and his wife who have a conflict that goes unresolved leading into the Sunday morning service. Ours started on a Saturday night. In a rare moment in our marriage, the hurt and frustration went unresolved and carried over into Sunday morning. We drove to church still struggling. We both chose not to go to Sunday school, but to go off separately to think, pray, and try to figure out how we each contributed to this rare circumstance of lingering conflict. How Are Mac & PC People Different? In an infographic that’s bound to cause arguments and perhaps fistfights, researchers at Hunch placed data from about 700,000 of its website visitors onto a deep illustration that shows just how different users of Macs and PCs are. They came up with interesting correlations between users’ chosen computing platforms and their demographics and personalities, as well as tastes in food, fashion and media. Many Christians inhabit the world of business, a realm that pastors frequently berate and misunderstand. There are dilemmas faced in the business world that go unnoticed by other Christians. This post is a sermon on business ethics from Proverbs that touched on some of those issues. It is structured around four priorities of business and a concise vision for business ethics. Millions of viewers enjoy watching the popular television show The Office. Could it be the show is much like a real life office? How does Dunder Mifflin make any money when so many people are not doing any work? The Office is full of characters that do not take their work Monday through Friday seriously. Sadly, TGIF is the norm for many workers who are gravely dissatisfied with work. With hopes of summer vacations, relaxing weekends, 401K’s, and early retirement. Then there is the American workaholic who thinks their hard work will some how bring them happiness, identity, or merit with God. Like one of the Seven Dwarfs [except Grumpy] whistling joyfully while working, “Hi, ho, hi, ho it’s off to work we go.” The average American works 40 hours a week, which means they will work over 100,000 hours in their lifetime. Work is not a savior, status symbol, or a means to gain acceptance with God. If you stand before God one day He will not let you in because you were on Forbes 500 list, nor will He keep you out of heaven because you lived below the poverty line. What do these verses have to do with work? A current application of the slave and master relationship is the work environment of worker and boss [or student and teacher]. It is interesting the Bible never denounces slavery, but it does give a new look at the slave and master relationship. According to many estimates over half of the people in the Roman Empire in Jesus’ day was a slave. Slavery then was not about cracking whips, trading ships, and inhumane treatment; rather slavery was a means of work to pay off debt and it did not last longer than 7-years. There was a level of respect and care within the relationship of a slave and his master. How does Christ give you are greater purpose for your work? First, obeying your earthly authorities reflects of upon your obedience of God’s authority. Jesus obeyed His Father because He had a holy sense of awe and respect for His authority. He had fear, not out of potential punishment, but God’s provision. In this passage is a deliberate word plan between master and Lord [Grk: kurios]. Biblically, every man and woman born into the world is a slave [cf. Romans 6]. In Christ, you are a slave to righteousness and a steward of your God-give life. Second, Jesus helps you to work with wholehearted sincerity, integrity, purity, humility, and loyalty. To be wholehearted means you work well even when your authority is not looking. That is what is meant when Paul goes on to say, “obey your bosses not only to win their favor when their eye is upon you.” What is eye service? It is to fear the opinion of man rather than God. Fearing God is always more important because His authority trumps any man’s authority. Be careful how you walk around and talk about your boss [or teachers]. I often counsel with parents who have children that do not respect their parent’s authority. I often ask the parents how they talk about their boss, parents, President, and authorities from the dinner table. Often disrespectful parents breed disrespectful children by the way they communicate about their authorities behind their backs. Third, Jesus encourages you when you are tempted to view your work as futile and meaningless. He gives you the courage to keep on and persevere. Many would rather quit, drop out, or give up. Some think of work as a curse [Genesis 3] and vanity [Ecclesiastes], which is true to some extent, but Christ gives you a greater purposes for your work. Do not get your theology of work from the Fall, rather get it from Creation. Fourth, Jesus encourages when you are tempted to view work as self-center quest for success rather than a sacrifice or service towards others and God. God gets the glory for any gracious success you happen to accumulate. Treasures of earth are miniscule compared to those of heaven. Seek first the kingdom of God, rather than building your own kingdom or corporate castle. Jesus gives your work a greater purpose. This is the will of God for your work. You please your boss and God by doing your work and doing it well. A great question to ask when you work is: how would Jesus do your same job? Work is an act of worship. It is not just a job. The way you work reflects on the one you worship. As you serve your boss you also serve God. How is work an act of worship? If you work with humility and integrity you are reflecting the character of Christ and therefore shining the gospel through the way you serve. Your work is an opportunity to shine the gospel. How you know if you love your work more than God? Is your work an idol? Do you treasure the Lord more than your money, power or success? Have you lost your passion for work or ministry because you think it is work? People say, “Pastor, it is easy for you to love your work and honor your boss because you work for God. You don’t know my boss. He is not God!” It is as if they think there is a distinction between secular and sacred work. However, there is no separation between secular and sacred work—all work is sacred. All work is for God. The reward in work is not earning a sweet home with fancy car, summer vacations to the beach, golfing on the weekends, socializing with the big-shots, building a huge pension to retire on, patting the portfolio, living it up with a life of leisure or luxury. If this is the reward you desire for your work you will be sorely dissatisfied. What is your reward for working with God as your primary authority? The reward has now and later benefits. In the future, your reward is related to your inheritance in Christ according to your faithfulness to Him [cf.5:5-6]. Today, your reward is Christlikeness, which blesses those working around you. Both slave and free will face the same strict judgment. I am certainly grateful that people work to serve others. Think of all the farmers, bakers, deliverer, and retailers that help get your food to your table. Think of all the nurses, doctors, surgeons, and pharmacists who help keep you healthy. Think of all the servicemen, policemen, firemen, judges, attorneys, and government officials who help protect your rights and freedoms. Every person plays a role in serving one another. Your work is a blessing to another person. Work is a fulfillment of Christ command to love your neighbor and love your God with all your heart, soul and mind. Work is a gift from God, and it keeps on giving as you faithful follow Him. God is impartial [Romans 2:11; Galatians 3:25], therefore bosses must not be impartial with their employees [James 2:1-13]. What “same things” should masters do for their servants? [All the above] Employees are to be treated with respect and honor because they are servants of God. Bosses are to serve those who serve them for this can influence those they serve them for good—modeling Christlikeness. In summary, work is a great place to work out your salvation with fear and trembling. Jesus wants to redeem your work. Remember your work is an act of worship that shines the glory of God and His gospel through the way you work. Jesus can transform the way you work by giving you a greater purpose. Make God your first boss for the rewards of working for God are great. The way you work reflects upon God. Therefore, don’t waste your work. Instead of feeling guilty that you are not “doing more for God” view all your work, studies, and ministry as a means to do more for God. 1. Check out Bill Streger’s blog who gives additional insight from Colossians 3:22-25: The Gospel and your work. Jesus gives our work new expectancy, new passion, and new character. 2. Answer: What two reasons does Proverbs 10:4-5 give for working hard at your job? What does 1 Thessalonians 4:11-12 say are the effects of a good work ethic? What does 2 Thessalonians 3:6-15 say about doing your work with diligence? What does 1 Timothy 6:1-2 say imply about the relationship between a believing employee and believing employer? What does James 5:1-6 say about the dangers of success? 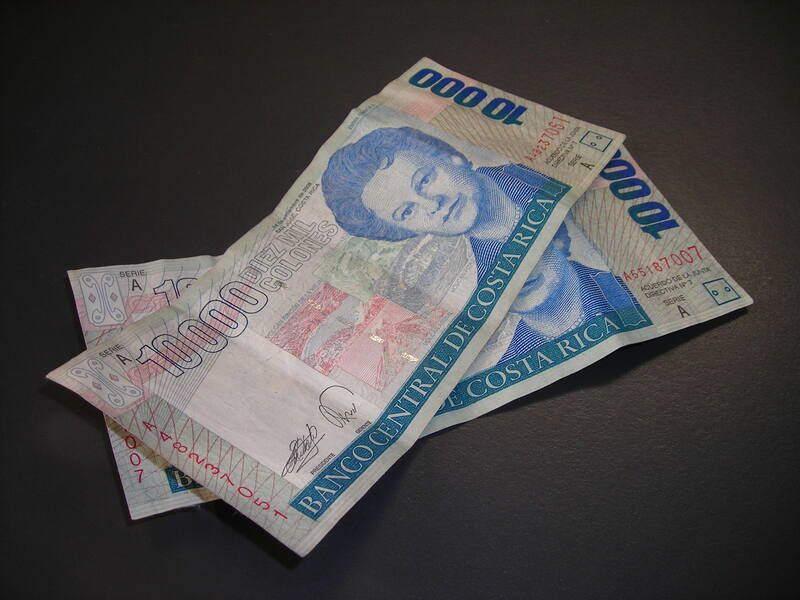 Yesterday, I found $20,000.00 in Costa Rica Colones [about $40 in US cash] in my pocket. I laughed out loud. Not only is it useless in the US, but I could have used it 4 months ago while Sarah and I were on our honeymoon. You see, when Sarah and I were leaving Costa Rica we were unaware that they had a departure tax. We spent most of our spending cash before getting to the airport so that we would not have to exchange it back to US dollars. The tax was about $40 US dollars. After looking through our bags for about an hour we found $34 and still needed more. The ATM’s would not take our cards and the departure flight was getting close to leaving. We praise the Lord for providing a stranger who gave us $6 to get the tax cleared. We were in such a pickle that Sarah was about to sell off her iPod for extra cash! Pray for wisdom. Not many couples invite God into their financial lives. God wants to be involved with the money in marriage. Marriage is always a joint relationship between husband, wife, and God. Pray that God to guide you in how he wants the funds earned, used, and distributed. Release control of your money and give God control (James1:5). Be Partners. Marriage is is no longer two “me’s” but not a “we.” (Genesis 2:24) In the one-ship of marriage couples lose their individual identity. This includes finances both what comes in and goes out of the home. From now on we are in this financial situation together and we have an equal responsibility and an equal opportunity. Set clear goals. Not clear as mud, but crystal clear. Setting goals is not just about finances, but it is about all things in life. It is having a plan for life. In other words, it is having a vision for the future. Where do you want to be? What do you want to be doing? Goal setting is where a husband and wife look at each other and say, “Where do we want to be in 5 years? In 10 years? In 15 years?” Finances fit into this plan (Proverbs 15:22). Unity. One flesh equals one bank account. It doesn’t matter who earns it. Some couples think that the one who earns the money spends the money or dictates how it ought to be spent, rather respect your unique contributions to the home. As the husband I bring in the majority of the paycheck, but my wife, she runs the home. What’s mine is hers and what is hers is mine (1 Corinthians 7:4). We do have separate savings accounts, which we use to purchase gifts for each other on occasions. Give up the insignificant things of life so that you can gain the greater reward of a unified marriage (Philippians 2:4). Divide and Conquer. Money management takes time, energy, knowledge, and wisdom. One of the common complaints about the money in marriage is the burden of so many responsibilities and commitments. Couples are forced to decide who will take care of the different tasks related to personal finances. Some things that might work are making a listtogether of all the jobs related to personal finances [i.e. balancing the check book, paying bills, retirement options, investment, etc.] and choose together the jobs you would enjoy doing, then get to work. Set a budget and stick to it. A budget represents the small goals you meet along the way to achieving your ultimate goals. Once the budget is set it is important that you track your progress. The best way is to meet together regularly [once a month or every 3 months] to communicate how it is working. Either spouse can call or schedule a family pow-wow. Our goal is on a Monday once a month to sit for a few minutes to walk through our budget plan. The meeting shouldn’t take any more than 15–20 min per week. Give to God first. The budget must start with what you will give to God and His work. We will give a predetermined percentage of our income to our local church and others in need (Proverbs 16:3). He provides all that we have and need, therefore, we must give back as an expression of our devotion and thanks to Him. Just like my story earlier, God provided for our needs in Costa Rica. It was only a few bucks. Now I have a reminder of His provisions through some colones. I know just who to give these too! !